Catalog Home > Rainbow® Colored Kraft, 36" x 1000' Roll, White, 40 lb. 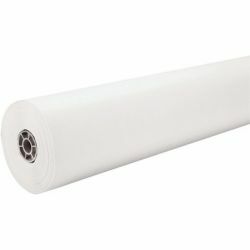 Rainbow® Colored Kraft, 36" x 1000' Roll, White, 40 lb. Lightweight Duo-Finish® Kraft paper in 16 bright colors! Two distinct finishes: a smooth side ideal for felt pen, finger painting and fine line drawing; the other side has a “toothy” surface which handles chalk, tempera, watercolor, or acrylic paints. 36" x 1,000' rolls fit standard rack dispensers. 40 lb. lightweight paper. Recyclable.